If you or your loved ones are suffering from knee arthritis, come join us for this highly informative session on practical solutions. Many patients with knee arthritis get disappointed with results of their treatments particularly when the treatments focus on a single modality like “surgery”, “exercise” or “medication. The pain and stiffness of knee arthritis tends to be multifactorial and it is difficult for a single modality treatment to produce satisfactory results. It is important to take a comprehensive biomedical approach to help patients with knee arthritis. Only by taking into account your specific medical condition can we select the most appropriate combination of medical technologies for optimal results. To find out how to recover from knee ache, pain and stiffness due to arthritis, speak to your doctor about a comprehensive approach. Whichever part of the world you come from, the onset of psoriatic arthritis can hit at any time. Although the symptoms may be relatively mild at first, it is one of the most rapid forming types of arthritis and at first affects joints such as fingers and toes and can also be associated with nail problems. The illness causes a general lack of energy and aches and pains which are debilitating. Eighty five percent of patients who suffer from the disease will have had skin problems at some time in their lives and this is an important link during the diagnosis stages. However, when the disease attacks cartilage which has been damaged accidentally or by wear and tear, the activity of the patient will be affected. The diagnosis of this disease will depend upon the patient reporting the early symptoms to their general practitioner who may ask for X-Rays to be taken of joints which are painful. The doctor will know the general state of the patient’s health and should be able to confer with the skin specialist and the radiologist to decide upon the course of action. In severe cases MRI scans may be used to look at the deterioration of the cartilage or cushioning between bones. Normal X-Ray procedures can only see the malformation of the bone structure while more detailed scanning methods give doctors a better picture of the evolution of the illness. Psoriatic arthritis can attack any joint in the body and thus taking note of where pain occurs the most will help doctors in their diagnosis. Usually patients will find stiffening is frequent after inactivity as in most arthritic conditions. The problem with traditional medicines is that these cover the pain by simply offering anti-inflammatory medicines and pain killers. What traditional medicine does not do is attempt to rebuild the cartilage forming the cushion within the joint. However, medical breakthroughs have given astounding results and have found that since a large percentage of the cushioning is collagen-based, building up that collagen or regenerating it may be the answer to the problem. With medicines such as Regenerix Gold, this is a real possibility. Collagen Hydrolysate, which is one of the ingredients found in Regenerix, stimulates cartilage repair. The general practitioner may also suggest exercises to help mobilization and these may be supervised by a physiotherapist over a number of appointments, who will also be able to suggest exercises which can safely be done at home to help with flexibility of the joint in question. However, these exercises and the traditional treatment only help discomfort. They don’t tackle the causes. Following the diagnosis of the illness, it may be decided upon that the joint needs surgical treatment, although if caught early enough, proper preventive treatments could avoid this from being necessary. As part of your daily intake of dietary supplements, balanced with gentle exercise and healthy diet, the body is given a chance to stave off the effects of psoriatic arthritis and continue to be active. Neck pain can be very debilitating. In this article, we explore some common causes of neck pain as well as treatment options, and alternatives. Whiplash – Whiplash is the result of the head moving forward and backward in a quick motion, often as the result of impact from a car accident. Degenerative Disc Disease – Degenerative Disc Disease involves irritated nerves, and/or possible herniation of vertebrae. This can result in severe localized or radiating pain. Lymph Node Swelling – Lymph nodes swell as the result of viral illnesses. The lymph nodes located in the neck can become tender and painful. Meningitis – Meningitis is a serious condition which involves inflammation and infection of the cerebrospinal fluid. Meningitis is a medical emergency. Its first symptoms include neck stiffness, lethargy, and headache, often accompanied by a rash. Try to alternate heat and ice at the site of the pain, three times per day, 20 mins on, 20 mins off. Use a thin cloth in between the ice and the skin. For heat, single –use heat wraps are available in drugstores. Alternatively, lie upon an electric heating pad on a low setting. You can also take a warm shower in place of a heating pad or wrap. Although keeping the neck still may seem appropriate, it will be necessary to avoid stiffness by returning to normal activities gradually, as soon as possible. Keeping the neck muscles limber and strong is imperative to healing and preventing future pain. Further, gentle stretching and moving within normal range of motion several times per day is beneficial as well. Avoid any strenuous activity. Pain relievers may be helpful, though they should be taken under the direction of doctor to inflammation; which is commonly involved with neck pain. Topical pain relievers can also help to increase blood flow and reduce pain. Massaging in some analgesic gels can in many cases, provide relief. A professional massage can do wonders for your well-being. It can increase blood-flow, stretch muscles and break up knots and deposits. This can result in immediate relief and relaxation. Stress levels of Cortisol in the brain, which can have a negative impact on the body. Cortisol also impacts or worsens feelings of pain. The more relaxed and content we are, the better equipped we are to deal with pain. If these strategies do not work well, always consult a doctor and possibly a good physiotherapist for further assessment. This article will provide an overview of some common treatments for back pain. Deciding what treatment to use will be based on the cause, and level, of the pain. This article is here to provide basic information to sufferers, so that they know the scope of treatment options. As such, this is not an exhaustive list. It is also necessary to seek out a licensed practitioner to develop a specific treatment plan. Rest – Lie down in a comfortable and natural position. Use pillows for support; don’t lift heavy objects or move the body unnecessarily. Ice or Heat – which one feels better? Try alternating them, throughout the day. Ice will be recommended for pain that comes with swelling or inflammation. Over-the-Counter pain medication; Advil or Ibuprofen for inflammation. Gentle Exercise – for pain related to tightness or tension, gentle exercise of the surrounding muscles can help loosen you up. Also, regularly working the back and shoulders helps posture by strengthening muscles. Get a supportive mattress. Your bed could be causing you the problem, especially if you are waking up feeling sore. These practitioners tend to get a lot of flack, because they are generally not licensed to practice in Singapore. While medical doctors are more trained at diagnosing and prescribing, physical therapists handle many pain issues, and especially those that are related to skeletal or musculoskeletal conditions. Chiropractors do their work using hands-on manipulation to align the body which have safety concerns for some people. Physical therapists may do massage and teach exercises that help the body align naturally. The basic theory overall is that proper alignment yields proper movement and thus, prevents or eliminates pain. You will find that you get your money’s worth when you see these professionals, because they take their time, and you are likely to see results. Alignment issues can be caused by something as simple as poor posture, or as serious as a physical accident. It’s a good idea to ask your doctor if they would recommend using either a good physical therapist. There are many medications out there effective in combating back pain. Again the type of medication that will be most effective may depend on the cause of the pain. Inflammations are best treated with Nsaids, such as Aleve and Ibuprofen, whereas muscle tension or spasms are often treated by muscle relaxants. There are also more potent medications used for pain which are controlled, such as hydrocodone or oxycontin, but these can also come with undesirable side effects; they are addictive, can be as debilitating as the pain itself, and do more to mask the pain than actually treat the source of the problem. Non-surgical Spinal Decompression is a newer treatment, which utilizes FDA cleared equipment to apply distraction forces to spinal structures in a precise and graduated manner, according to AmericanSpinal.com. The process gently stretches the spine and changes its force and position. During the procedure, the patient lies down on their stomach or back and relaxes, while a revolutionary traction machine is able to separate the vertebrae, lessening the impact of discs responsible for that intra-vertebral pressure. Non-surgical Spinal Decompression is used to treat nerve issues, joint issues, or degenerative disc disease, as well as pain, numbness, weakness or tingling. It is not recommended for arthritic pain. Surgical Spinal decompression is quite invasive, and involves making cuts to the discs in order to relieve pressure. Surgical decompression is generally a last resort, according to WebMD. Surgical decompression is used to treat pain, numbness, tingling, and weakness. The most commonly used electrical stimulation is Transcutaneous Electrical Nerve Stimulation (TENS). It is also commonly known as Bioelectric Therapy. This treatment is used to provide short-term pain relief, so that it is not used for chronic pain. A low-voltage device delivers electrodes near the source of pain, which scrambles pain messages to the brain, resulting in relief. IDET is Intra-vertebral Electro-thermal Therapy, in which a small catheter is placed inside of an incision, and 90 degrees of heat is applied to the area, modifying nerve fibers and essentially, disrupting pain receptors. These types of invasive treatments are used when alternative treatments have been exhausted. Rheumatoid arthritis is an autoimmune condition where the bodys’ own immune system attacks itself. Our body immune system will usually produces anti-bodies for attacking foreign viruses and bacteria, and thus protects our body against any infection. But in those affected by Rheumatoid arthritis, the body-immune system will send antibodies to the joint lining, which actually attack the surrounding tissues and the synovium of the joint. The synovium of the joint is a thin layers of cells that cover our joints, but as the antibodies attack this membrane and synovium, they become inflamed and sore. The inflammation process releases chemicals which both thickens the synovium and damages the cartilage, tendons, ligaments and bones. Repetitive flare ups eventually causes the joint to loose its normal alignment, congruency and shape. It is a progressive disease, initially starting in the smaller joints like toes and fingers and moving to larger joints bilaterally such knees and shoulders. Joints will feel hot, swollen, stif and appear red and may be the most painful in the mornings. A person will also complain of muscle tightness with symptoms varying from patient to patient. Often an individual will report flare ups in symptoms rather than a permanent pain, with flare ups becoming more frequent an intense as per the deterioration of the condition. The other symptoms include lining of blood vessels, lungs and heart, salivary and tear glands. Rheumatoid arthritis is found more commonly amongst women because of the estrogen (a female hormone). Although not conclusively proven, research has shown estrogen to be a key hormone responsible for the progression and development of this disease. Genetic or hereditary transportation of the problem is also another cause. Certain lifestyle habits such as smoking and excessive alcohol consumption may make an individual more prone to the disease. The main treatment of this Rheumatoid arthritis is to give patients relief from pain, reduce the inflammation in the joints and finally slow down & prevent damages to the joints. Different patients respond in different ways to these treatments. One of the best known drugs used for the treatment is Disease-modifying anti-rheumatic drugs (DMARDs). The drug is very helpful in easing the symptoms and slowing down the damage caused with the disease. The drug blocks the effects of the chemicals that damage the bones, cartilage, ligaments and tissues. Leflunomide, methotrexate, sulfasalazine and hydroxychloroquine are the different conventional DMARDS. Osteoarthritis is a very common progressive disease caused by excessive wear and tear of our joints. It usually affects people the latter half of their lives affecting most commonly the spine, hips, knees and hands. In this condition, the cushioning structures of our joints i.e the cartilage which normally functions to allow our bones to glide smoothly over one another becomes worn with time. Unfortunately with the lack of cushioning, the bones begin to rub together, causing inflammation at the joint surfaces swelling, pain and ultimately stiffness. This has a direct impact on the range of motion of the joints. In some severe cases, joint deformity can occur leading to poor alignment or Herberden’s node forming. The eitiology of this condition is not conclusively known; but it is associated with aging. 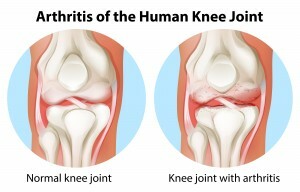 Although more commonly found in older populations, osteoarthritis can affect younger people as a result of a genetics (juvenile arthiritis) or as a result of previous trauma to a joint, i.e a fracture. Experts deem that mechanical, chemical and metabolic factors may also play a considerable role in this process. Another important consideration is an individual weight; as many of the joint such as the knees and hips are weight bearing joints, excessive loading with obesity can speed up this degenerative process. Work ergonomics and hazards may also cause excessive stress on joints leading to an acceleration of arthiritis of such joints. 1) Anti-inflammatory and non-steroidal drugs that can relieve you from your pain, swelling and inflammation. Although it is a good reliever of all these symptoms, its long term use can cause stomach problems, in the form of ulcers and bleeding and heart problems. 2) Acetaminophen (Tylenol) for reducing only pain, not inflammation. This also has some side effects including liver damage in alcoholic patients. Advice from a medical practitioner should always be taken before taking any medication. Knee Arthritis or Knee Osteoarthritis (Knee OA) is a major cause of disability. It can drastically affect a person’s mobility and quality of life. Knee arthritis is commonly known as a degenerative, wear and tear, age related condition. 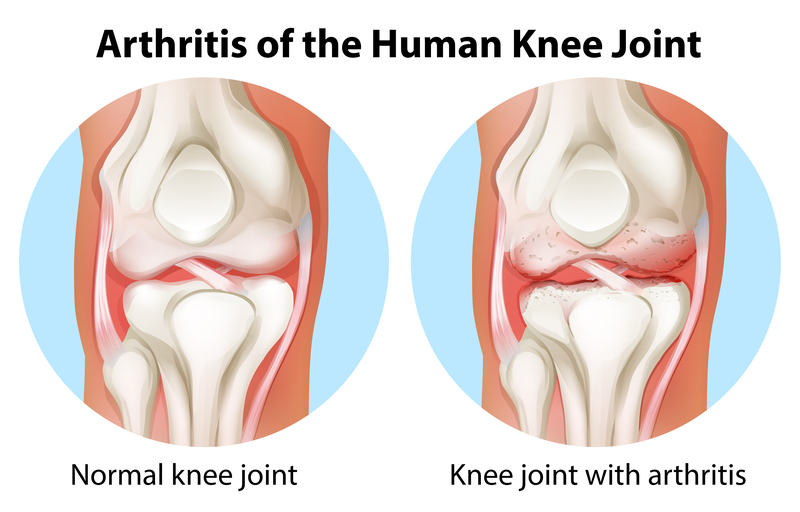 While it is usually not a dangerous knee problem, this description reflects the idea that knee osteoarthritis is a condition that gets worse with time, often leading to knee replacment surgery. Knee arthritis is associated with knee injury due to trauma, infection, and excessive body weight. Knee arthritis often develops over many years. In the initial stages, there can be periods of relatively little knee symptoms, interspersed with “flare-ups” of inflammation and pain. Patients learn to “live with” or ignore the occasional symptoms during this stage. The eventual progression to more severe and frequent pain can make the condition appear to have developed quickly. A person’s lifestyle can also affect the progression of knee osteoarthritis. Repetitive stress injuries from squatting, kneeling, and lifting heavy objects can put more pressure on the knees, resulting in more frictional degeneration. Athletes tend to place more stress on their knees, and also face the increased risk of traumatic knee injuries which predispose to knee arthritis. My pain is persistent. I’ve tried gels, painkillers, injections, and alternative treatments which did not work. There is no choice except for surgery. My pain is due to wear and tear, age related degeneration. Nothing much can be done, while it gets worse with time. My physical therapist and doctor both tell me to exercise more but I am not feeling any better. I am just not trying hard enough. How Does Knee Arthritis Affect Us? How Do We Diagnose Knee Arthritis? The diagnosis of knee arthritis is usually quite straightforward to a doctor who knows about the history of your knee condition and performs thorough physical examination. The difficulty is almost always the “what to do” part after a diagnosis is made. Imaging investigations such as an X-ray and MRIs can be helpful in assessing the severity of your condition, and also for evaluating other co-existing knee conditions. Blood investigations and a knee aspiration can also be helpful if an infection or another cause of knee inflammation is suspected. It is worthwhile to note that in Singapore, CPF Medisave can often be used to help pay for diagnostic scans of knee arthritis. If the problem is not severe, appropriate medication can be utilised to treat and manage the symptoms of arthiritis. It is one of the best recognized therapeutic management options for arthritis knees. Under the supervision of a professional therapist, a patient can improve the motion and strength of the joints. Exercise therapy, electrotherapy, mechanical aids like splints and braces, joint mobilisation techniques, hydrotherapy and gait re-education are all useful and effective methods available to help sufferers of knee pain. Indian Yoga, Chinese Tai Chi, Homeopathic medicines, acupuncture, mind-body medicines and the traditional treatment balneotherapy and many more holistic treatments are becoming increasing popular. Visco-supplimentation is a type of treatment, in which ‘hyaluronic acid’ or artificial joint fluid is injected to the knee, so that it can act as a cushion the joint. Unfortunaly this treatment gives the patient only short term relief and comes with possible risks. Among the surgical options for treating knee arthritis, arthroscopy, osteotomy and knee replacement surgery are among the most common. As they differ in terms of potential risks and benefits, it is important to discuss with an experienced doctor your specific condition before deciding whether this is an option to consider. Based on what medical science has to offer today, the majority of patients can enjoy active lives free from knee pain and avoid the need for knee replacement surgery. In patients with knee aches, pain and stiffness, it is important to first consult a doctor for a clear diagnosis. If your current treatment choice is based on a clinical diagnosis without any imaging investigations, it is a good idea to consider doing an X-ray or an MRI if your current treatment is not working. Patients who have milder arthritis can focus physical therapy and prevent deterioration with nutritional solutions. Where access to frequent physical therapy is difficult, analgesic rubs, plasters and gels can also be good options. Patients with more severe knee arthritis can benefit from the non-invasive treatments available in many Singapore clinics.